Wine has been a dietary staple of mankind for millennia upon millennia. 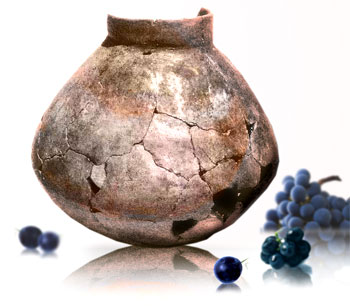 Since the creation of the first ritual vessel over 9,000 years ago it has been possible for men and women to create a wine like substance of fermented fruit. Fruits gathered as ancient hominid nomads first roamed the valleys and mountains of the world, exploring its marvels and magick for the first time. And stored in the hopes of keeping the delicate treat for a harsher season: and voila ~ wine was born! From these earliest times up to the modern day, wine has held a special place among the drinks of men. Sometimes merely a staple beverage, sometimes taken purely for its intoxicating powers, but more often than not, the popularity of wine has been due to its ritual significance in culture after culture that discovered this remarkable indulgence. According to paleontologists the vine flourished before the ice age in the polar regions: Iceland, Northern Europe, North-western Asia, even in Alaska. The glaciers, though, limited its spread and isolated one variety from another, thus creating several different species of vine. The ancestors of the current grapevine "moved" to the warmer areas of central-eastern Asia and central Europe, mainly however to the greater southern Caucasus region, where, between the Black Sea, the Caspian Sea and Mesopotamia, Vitis vinifera, subspecies caucasica, arose, the one that - in several varieties - is cultivated up to this day. 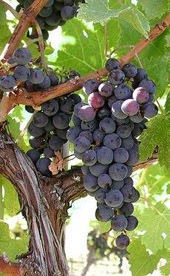 The ancient Persians, the Semitic peoples and the Assyrians are considered the first known grapevine growers. The skill of viticulture was then passed on to the Egyptians, the Phoenicians and to the people who lived on the peninsula of Greece. The Mediterranean is not the only place where the grapevine was cultivated at the time. During the same period there are mentions of wine in ancient China as well. Wine, as we most commonly know it today in aisle 17 of the supermarket, is made from fermented grapes. As such, it first appeared approximately 7,000 years ago in the mountains of the Middle East, specifically at two known archaeological sites: Shulaveri, the late Neolithic typesite of the Shulaveri-Shomu culture in Georgia and Hajji Firuz Tepe, a slightly later (5400-5000 BCE) Neolithic village in the Zagros mountains of Iran. The earliest grape presses, used to mass produce larger quantities of wine, date to the 3rd millennium, and have been found at sites in Turkey, northern Greece, and on the plains of central Mesopotamia. The domestication of the grape and widespread viniculture likewise appears to stem from this same timeframe. Historically, viniculture spread out from the mountains of the Near East. And with the rise of complex cultures in the Middle East and the Mediterranean, wine gained an even greater foothold ~ burrowing its way into the meals and the sacred religious traditions of the peoples it came into wider contact with. Traditions we are aware of courtesy of ancient art, early texts, and of course, classical myth. Before we begin our exploration of the magickal history of wine, viniculture, and viticulture, there are three intriguing facts that bear remembering throughout the article: Firstly, that most wine in the ancient world was red wine according to modern chemical analyses of the remaining vessels that have been uncovered. Few samples of white wine have been found, the majority of which have come from the same source: none other than the famous King Tutankhamun’s tomb. Secondly, that wine was typically consumed in a diluted format: mixed with water, other fruit juices, honey, etc. Ancient man would pretty much be appalled at the sheer strength of modern wine, which to their palate and alcoholic endurance would be entirely unsuitable. In other words, wine was not always drunk just to be, well, drunk, to use the other meaning of the word. Intoxication was not always what wine was consumed for. In a world where water wasn’t safe to drink alone, other things, like wine and beer substituted as the daily go-to drink when it was readily available. And when it was not readily available it was highly prized for its scarcity. preservative signifying that what was held in the vessel was not simply just grape juice. In the case of Hajji Firuz Tepe’s wine, for instance, the resin of the terebinth tree, a natural preservative, was identified alongside calcium salt indicating that the grape juice was intentionally fermented to make wine.